ThermoSmart was successfully funded at Symbid, with this crowdfunding financing round they can expand to the rest of Europe! Symbid talked to the entrepreneur behind ThermoSmart, co-founder and CEO Hans. You can now read his story! Check out the pitch page of ThermoSmart here. I decided to start this adventure when I wondered how ugly and unfriendly current thermostats are. I had bought a new house and came to the conclusion that there's no thermostat available that is adding value to our lifestyle. Besides it takes a full-time study to understand the user's guide. For this reason I decided to develop a thermostat that looks good and is extremely easy to use. I make things happen. Founding ThermoSmart is the most perfect example; I wanted a solution so I did it. I carefully have been building a team each with their own valuable expertise that was needed to succeed. That's one of my great talents; create a team with the right people at the right time and with the right skillset: people that are better than me. It’s a team effort wherein the total is more than the parts. That's the only way to exceed our goals. My roll is to maintain a clear vision, define our roadmap, open doors and connect new partners. Thermosmart started out of personal frustration. Founder Hans was looking for an elegant and easy to use thermostat, which effortless saves energy. With its inspired team, ThermoSmart strived to develop a unique product in the explosive ‘smart home’ market. A fancy Dutch design combined with patented intuitive usability. The company pays much respect for the privacy of its users and works independent from energy companies, while maximizing the innovative possibilities of our time. With a user focus in all disciplines, ThermoSmart makes sure the product and its use are full serviced via on- and offline support. 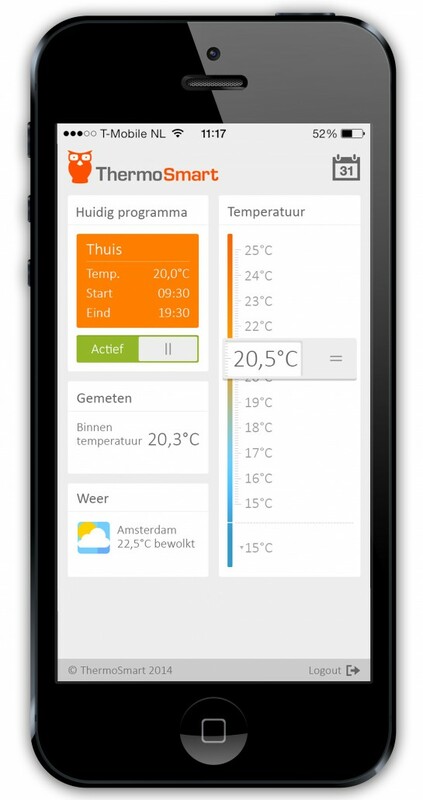 We are founded in 2013 and from that moment we developed the ThermoSmart together with our first users. At ThermoSmart we believe in co-creating and the feedback loop. We listened to their feedback, solved the issues they faced while using and we lived up to their needs. This collaboration with our users resulted in the public price from the Dutch Consumers Association Consumentenbond. We've sold thousands of ThermoSmarts on our Dutch home market. Our launch on Dutch leading warehouse Bijenkorf was a direct success and we got sold-out. From there we expanded our distribution to leading on- and offline resellers like Apple Premium Resellers, MediaMarkt, Coolblue and Bol.com. As we first had a typical Brand Strategy, focusing on optimizing the product, its usability and our own webshop, we currently developed to a Partnership Strategy since we are ready to scale-up. Via our (international) strategic partners we aim to pump up the volume with our proven product. almost every possible (mobile) device. In opposition to our competitors who are technical driven, we took the user as our starting point. This resulted in a Dutch Design, based on minimalism and intuitive user interfaces. Although we think our design is beautiful in every household, we even made it possible to customize the hardware to your personal preference. This all resulted in a user oriented product which helps you saving energy in an easy and fun way. For example by providing power usage reports, best-in-class usability and self-learning ability: ThermoSmart directly starts saving energy (and money). What is the main goal of your equity crowdfunding campaign? Our main goal is to commit ambassadors of our product. We realize that crowdfunding is not really 'easy money'. Compared to more conservative ways of financing crowdfunding is far more complicated and labor-intensive. But the output is more than worth it: committed ambassadors, who believe in our product and spread the word. Investors, who are involved with our developments and provide feedback from a customer perspective. Besides, the campaign makes it possible to reach new (potential) clients. So, in short, crowdfunding is a lot more than funding and that's just the reason for us. Elaborating on the previous question, another reason we chose for crowdfunding was the opportunity to add equity. To realize our international plans we have a financial need of € 600k. € 450k is already funded via our own investing partners, partly debt and partly equity. For a healthy solvency ratio it's important to add more equity, so for that reason we chose for equity crowdfunding. 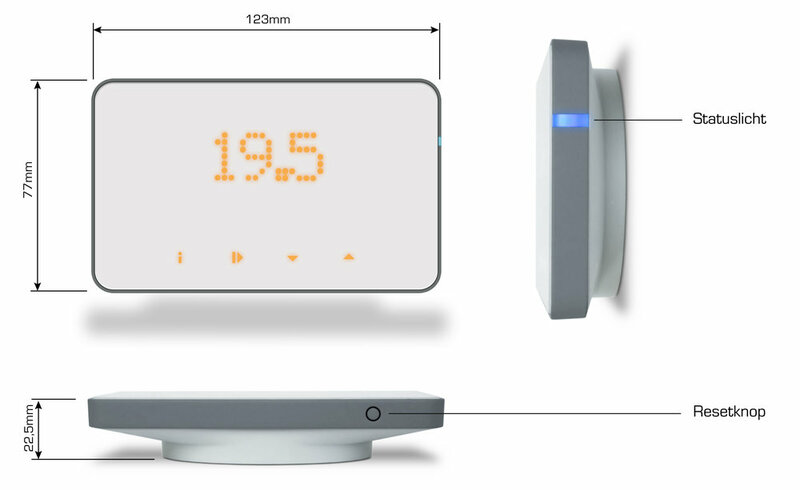 And last, but not least: we offer a free ThermoSmart for backers who invest more than € 1.500, so try it yourself and spread the word! ThermoSmart is successfully funded through equity crowdfunding at Symbid, view their full pitch here.